Super absorbent pad turns body fluids to solids! No more dealing with messy commodes! No more spills or splashes! Never Clean a Pail Again! 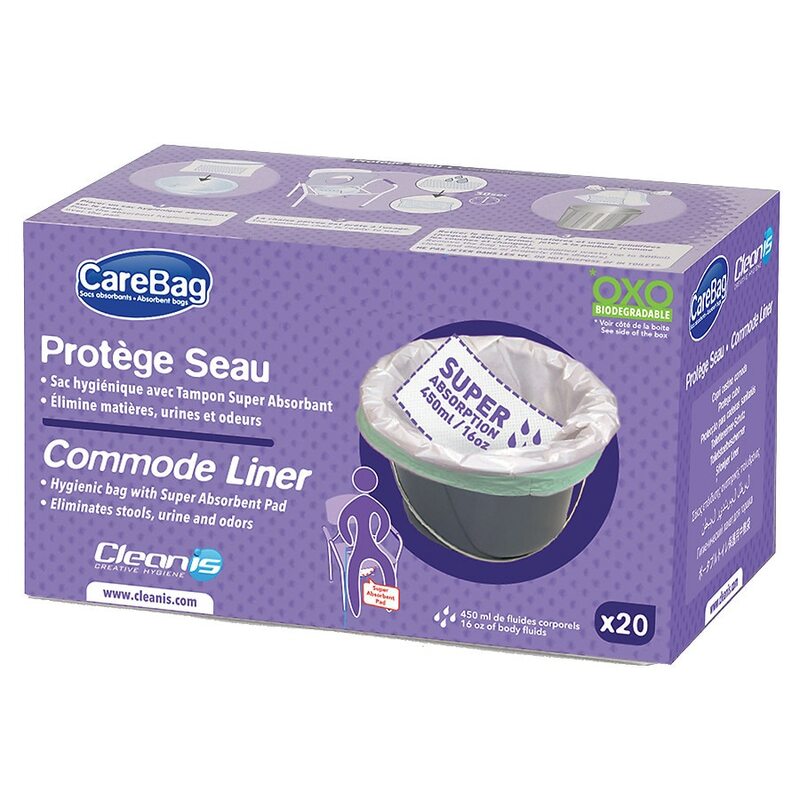 Carebag Commode Liners are 100% Oxo-Biodegradable! The Carebag Commode Liner from Cleanis is an Oxo-Biodegradable medical grade bag equipped with a unique super absorbent pad which turns up to 16oz of body fluids into a gel in a matter of seconds! This single use item fits over most commode pails. Designed and recommended to avoid commode soiling, it dramatically enhances comfort and convenience for both the user and his or her caregiver. Great for home, while traveling, or in health institutions. Position the liner over your commode pail and it will be ready for use! To close, pull the ties and tie a knot around the liner using the ties. See instructional images located at the top of the product page. 1) Open box and unroll the first liner by tearing along the perforated line. 2) Position the liner over the commode pail with the pad flat on the bottom. 3) After patient uses bedside commode, body fluids turn into a gel within seconds. 4) To close: Pull straps tightly and tie a knot. Dispose of the sealed bag in your household waste just like diapers. Do not flush. Plastic bag cause suffocation, keep away from children. Flush eyes or sensitive areas with water if they come in contact with enclosed powder. Dispose of properly, or, in case of infection, in biohazard wastes.